Just Romantic Suspense: Where DO I get my ideas? Congratulations to "Pam" the winner in Julie's giveaway. Thank you to all who participated! Other than some silly questions about whether that’s my husband and/or me on the cover of my books, or “Will you write a story about me/my dog/my Uncle Fred/my trip to Mars?”, this is probably the question I get asked most as a writer. I’m a lifelong student. I love to read, travel, watch movies and tv shows, take classes and attend workshops. As a shy person, it has always been easier for me to ask questions of other people and learn about them than it is to talk about me. And thankfully, most people like to talk about their work, their family, their ideas, etc. I’m continually filling my brain with observations about people, places, facts and emotions. So when it comes time to create a story, I’ve never been at a loss for ideas. There are always more zipping around inside my brain than I have the time to write. Plus, growing up as that shy kid, I was forever making up stories in my head to entertain myself—I was never bored. I guess that’s just the way my brain has been trained to think—learn something interesting, see something new, feel an emotional connection to something, and voila! I’m already converting it into a story inside my head. 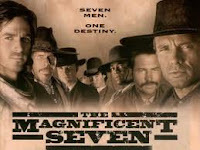 The Magnificent Seven—In its multiple movie or tv show incarnation, this is the type of Western story that has appealed to me. A team of very different characters, each with different goals, emotional baggage, different skill sets and talents, must come together to defeat the enemy. (If you’ve read any of my books, you’ll see this is a recurring theme—a Precinct full of cops? A task force put together to solve a series of heinous crimes?) Plus, along with inspirations like BONANZA, SILVERADO and OPEN RANGE, I love the character that makes up a cowboy hero. He may not be the most eloquent man on the block, but he knows how to treat a lady, he knows right from wrong, and he gets the job done. The Closer—In a small way, my heroine is based on Brenda Lee Johnson (portrayed brilliantly by Kyra Sedgwick—man, I’m going to miss that show! Hope the new version is just as good). How small? Well, my heroine is a stylish blonde who wears a trench coat. The beautiful countryside in central Missouri—I needed a rural location for my small-town sheriff to come from that would be totally different from the urban landscape of Kansas City where he teams up with a Ph.D. heroine from the city to solve his sister’s murder. 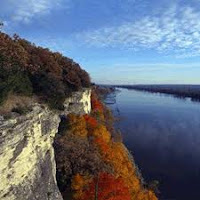 So I went with the autumn scenery around the Missouri River, not too far from where my mom lives now. I combined two real places I’ve often visited and came up with the small town of Grangeport, Missouri. Now to tease you a bit—here’s a short-short scene from KANSAS CITY COWBOY. My heroine just had a close call with a bad guy, and my hero, waiting for her to get off work at KCPD to ask her to dinner, was in the right place at the right time to help. Did my inspirations help me get Boone Harrison, my cowboy hero right? Mules weren’t the only stubborn thing his folks had raised on their ranch. Boone pulled back the front of his jacket and splayed his hands at his hips. He didn’t get why he was so attracted to this prickly woman who had to be as wrong for him as his ex-wife had been. But he clearly understood his duty as an officer of the law, and as a man. What inspires your creativity? Or do you just want to talk cowboys and hunky heroes? Who are some of your favorite fictional Western characters? I’ll give away a copy of KANSAS CITY COWBOY (print or Kindle version) to one lucky poster. So many great westerns to choose from. I loved Bonanza and The Magnificient Seven but, my all time favorite, would have to be Scott Lancer of Lancer, a show I didn't discover until 2001, long after it was cancelled! Music is great for inspiring my creativity, I am always listening to music. Now when we talk about cowboys...I do not have one in particular but love those alpha males that seem to be able to make everything better. I find music very inspirational, too, Pam. Although I can't listen to it while I'm actually writing, it is a wonderful tool to inspire creativity. I do a lot of brainstorming to music. Even going to one of my son's concerts--sometimes, I'll hear something and it sparks a story idea. Hey, Karen--Oh, yeah! James Garner can do a cowboy like few men can. As a kid, I loved him in those Disney movies, Support Your Local Sheriff/Gunfighter. Did you ever see the movie MURPHY'S ROMANCE? w/ James Garner and Sally Field? He did a great modern cowboy in that one. Love him! YES - a favorite of mine! Then there was the Rockford Files and the Notebook and so many more. Thanks, LS! It's always appreciated to hear when a reader loves my books. My next release will be an Intrigue Holiday Anthology this December (actual release date is last week of November) called THREE COWBOYS. I wrote it with Dana Marton and Paula Graves. My next Precinct: Task Force book will be TACTICAL ADVANTAGE, out in March 2013. I find nature very inspiring. By looking at the countryside and then imagining a person that could conquer a little piece of it, I find a character that I would like to know more about. Thanks for the contest and for your great writing. I love your idea of "conquering" a piece of the countryside. I think that's how a lot of pioneers must have felt. Very inspiring. Love that cover... kinda looks like one of the actors on CSI wearing a cowboy hat! Children are often inspiring, aren't they? And one of my favorite things about traveling is to see the diversity and wonders of nature. Definitely inspiring. Nice post. I like reading about cowboys. Me, too, bn100. But this is the first time I've written a true cowboy hero. Then I got to write another one for my December anthology. We'll see if there are any more cowboys in my future. Right now, it's back to cops and crime scenes. My creativity takes the form of craft work. I see something & decide to give it a try. Never perfect, but so much fun. I've always admired people who do crafts, marybelle. What kind do you do? I love going to see things at craft fairs, but I've discovered that's not where my talent lies. I used to do a lot of sewing--made all kinds of things for the house, plus clothes and gifts. But I don't have time for it anymore, other than same basic mending. Sigh. I have a couple of friends who are avid knitters, and I so admire their work. I've tried it, but I've got a ways to go before that becomes a hobby. I love to talk about cowboys and hunky heroes. As for creativity, I let a lot of junks out of my head and then edit them or see which would work. Interesting writing method--kind of shotgun-like to throw them all out there and see what works for you. Every writer has a different process. I grew up with Gunsmoke, Bonanza, and Big Valley. Check out the two hunks in Alias Smith and Jones. Loved that show! Thanks! You've named some classics, Shelly B. I watched a lot of Gunsmoke and Bonanza with my dad--loved sharing that time as well as enjoying the cowboys and drama. Alias Smith & Jones is one I never watched, probably because Dad didn't. Didn't that have Peter Duell (sp?) in it? I remember him from a John Wayne movie. Blanking on which one right now. I think he played Billy the Kid (supposedly before he became an outlaw). Yes, Peter Duel, and Ben Murphy. Both cuties! Sorry, one more thing.. I love The Closer, too. It has broken my heart the last two weeks. I don't know what they're going to do wirhout Brenda! I've been so busy the past couple of weeks, Shelley, that I've missed the episodes--but I've got them recorded to watch once I get this book done! So don't tell me anything ;). Don't want to miss a moment of THE CLOSER! I've always like Mary McConnell as an actress, and I like her Capt. Raydor character on the show--she and Brenda have been great foils--and it's neat to see Brenda make a 'friend', even if she doesn't always know it. And, I love the supporting cast! But I'm just not certain what it'll be like without Kyra Sedgwick. My fingers are crossed that I'll be pleasantly surprised. Book sounds great - a cowboy and brenda leigh - perfect combo :) I had a feeling Gabriel was the leak for a while even though it killed me to think so because he was her only supporter when she first came to LA. I was glad that is wasnt technically him.. And that final scene when she goes in and finds her mother - heartbreaking. Rockport and La grange mixed together? Cute. Since I live in rural Pettis Co...I knew Grangeport wasn't real but I still like it!